NC disrupts parliament meeting - Integration Through Media ....! KATHMANDU: Today’s meeting of the House of Representatives has been put off by issuing a notice as the main opposition Nepali Congress lawmakers disrupted the House meeting twice arguing that the incumbent government took no concrete decision regarding the hospitals established with the names of NC’s leaders late Girija Prasad Koirala and Sushil Koirala. As all the NC lawmakers stood up from their seats, Speaker Krishna Bahadur Mahara gave time to NC lawmaker Prakashman Singh to speak immediately after the beginning of the House meeting. At the meeting, Singh said that serious attention of NC was drawn about government’s non-decision on two hospitals established under the NC leaders’ names adding that NC would continue to disrupt the House meeting until the government informs the House that Girija Prasad Koirala Respiratory Hospital and Sushil Koirala Cancer Hospital would be kept under the Federal Government. With this, the NC leaders encircled the parliament rostrum, obstructing the regular proceedings. 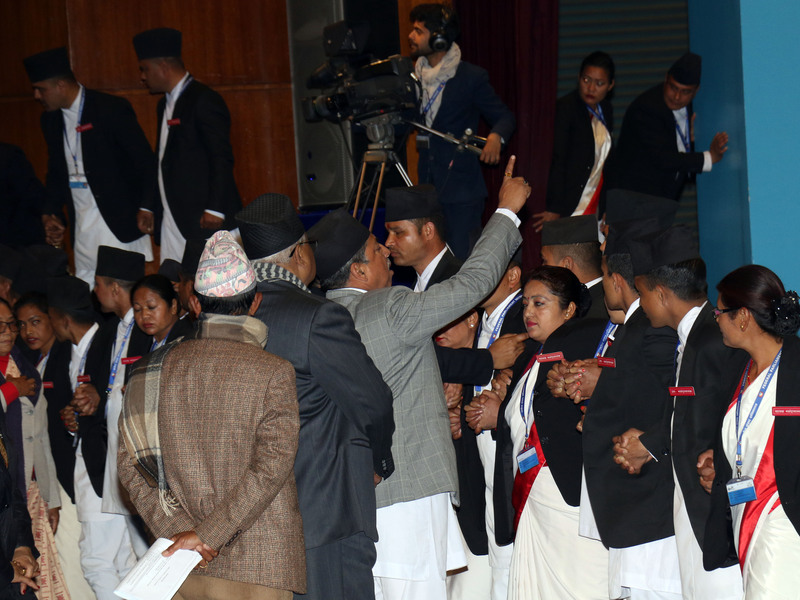 Saying that he has already drawn attention of the government, Speaker Mahara urged the NC lawmakers to cooperate to forward the House meeting ahead. But, Speaker Mahara put off the House meeting for 15 minutes as the NC lawmakers continued their disruption. Following this, Speaker Mahara offered time to Minister for Education, Science and Technology Girirajmani Pokharel to table the bill on National Medical Education Bill in the House. But, the NC lawmakers again continued their protest forcing the Speaker to postpone the House meeting for yet again 15 minutes. While coming out from the parliament meeting, former Prime Minister Dr Baburam Bhattarai said that postponing the House meeting until the PM’s arrival would be appropriate. Likewise, lawmaker of Nepal Communist Party Yogesh Bhattarai termed the opponent party’s activity as ‘inappropriate’. The next meeting of the House is scheduled for 1:00 pm on January 25.